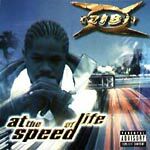 Xzibit's debut album and quite possibly his finest piece of work. Hard, bangin', Underground Hip Hop for all the Hip Hop junkies. Executive produced by E-Swift and Xzibit. Guest appearances by Tha Liks, Hurricane G, Ras Kass, and Saafir.